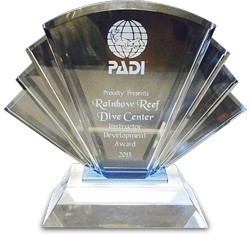 World Resorts of Distinction (WRD), is proud to announce that one of its boutique resorts has been awarded a distinguished PADI Green Star Dive Centre Award. The award went to Toberua Island Resort in Fiji. It’s a unique, privately-owned island set on four sandy acres of lush, tropical gardens located in the middle of a private azure lagoon off the east coast of Fiji’s main island, Viti Levi.